reports that on the same day Ivanka Trump and her husband Jared Kushner joined a Mar-a-Lago dinner with Chinese president Xi Jinping, the Chinese government gave provisional approval to her company for three new trademarks. Instead, the first daughter and her husband have emerged as prominent interlocutors with China, where they have both had significant business ties. And Ivanka’s business, according to the Associated Press, is doing quite well, despite the boycott efforts of the #GrabYourWallet campaign—U.S. imports, mostly from China, increased around 166 percent in 2016, while data from e-commerce platform Lyst shows that after Donald Trump was elected president, the number of Ivanka Trump products sold through Lyst shot up. 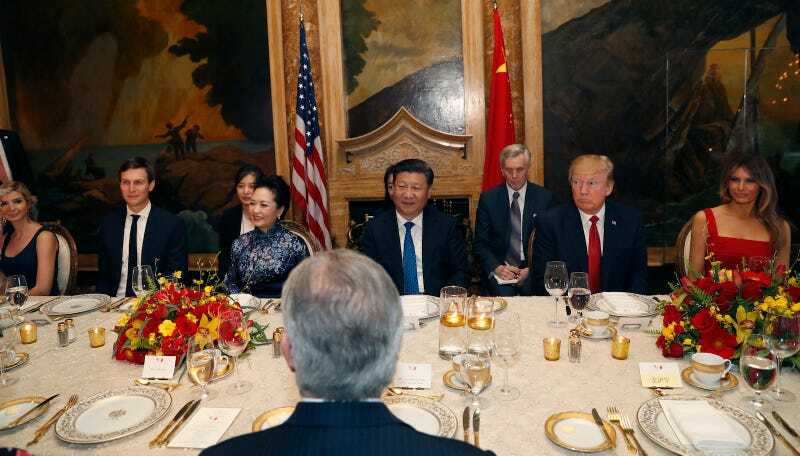 Gorelick told the AP that the couple will avoid specific areas that could be seen as conflicts of interest, but are not legally obligated to step away from broad issues like trade with China. Welp, nothing to see here, folks! Move along, now.